We love that people all over Australia can purchase their very own Vuly from the comfort of their own home using our Online Store. But, until now only our Brisbane customers could come and try the Vuly magic before purchasing one of our amazing trampolines. Well, we have good news for our Sydney and Melbourne based customers now – our Westfield Hornsby and Westfield Fountain Gate pop-up stores are set up and ready for keen bouncers to kick their shoes off and play on our display stock. 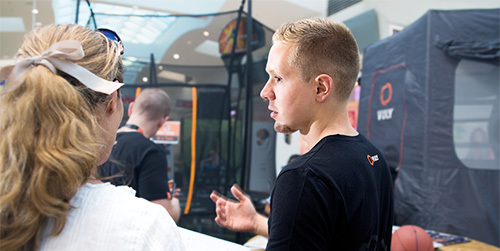 At our pop-up stores you'll be able to get up close and personal with both our Classic and Thunder trampolines, and check out all of their great accessories. Vuly staff will be on site to answer any questions you may have about purchasing a trampoline from us – and we even have stock available to purchase while you're there. Customers in other areas don't worry; you can find resellers with display models using our Store Locator – and of course you can contact us with any questions you have regarding your own Vuly purchase. We love to see keen Brisbane bouncers at our showroom at Vuly HQ as well, so pop in and have a bounce on our display models today!